So while, “The Quilt” happens to be everyone’s favourite Chughtai story, given the context and the uproar it created on publication, I decided to read something else by her for today’s story. “Touch-Me-Not” seemed that it wanted to be read and so I did. Ismat Aapa wrote about women – behind closed doors, the ones who wanted to go out and do something, and the ones who never got around to doing anything, but just being a body that gives birth or is made for that and of course to please her husband. “Touch-Me-Not” is one such story of the narrator’s Bhabhijan who has been married for over three years to her brother and not being able to give birth to a child. When she is pregnant again, the narrator’s Ammijan and Bi Mughlani decide that the delivery should happen in Aligarh – away from Delhi and the story unfolds as the narrator, Ammijan, Bi Mughlani and Bhabhijan are headed to Aligarh, with an entire train bogey booked for them. Chughtai conveys a lot through this short story. She speaks of how Muslim women who do not give birth, have no other option than to witness their husband’s second marriage, and in turn resort to prostitution. Bhabhijan constantly goes through that fear and in that wake the story ends, with a pregnant peasant woman entering their compartment and things going out of control. I loved the story. It made me wonder and think of times – this of course is set pre-partition, that the writer lived in and what prompted her to write such tales. 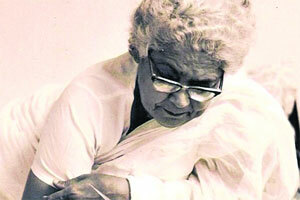 Chughtai’s prose is simple and hits the reader in all the right places. The translation by M. Asaduddin is also quite clear and precise. Chughtai was a feminist like no other. A writer like no other. Read her and cherish her works. This entry was posted in 387 Short Stories, Books, Ismat Chughtai, Review, short stories and tagged 387 short stories, Ismat Chughtai, Muslim community, Penguin Evergreens, pregnancy, Touch-Me-Not on December 22, 2013 by thehungryreader.